Opera is a performance art that students, myself included, rarely experience. On Friday March 3, 2017, I went to the student production of The Tales of Hoffman, created by Jacques Offenbach, to discover what wonders were held within the opera. 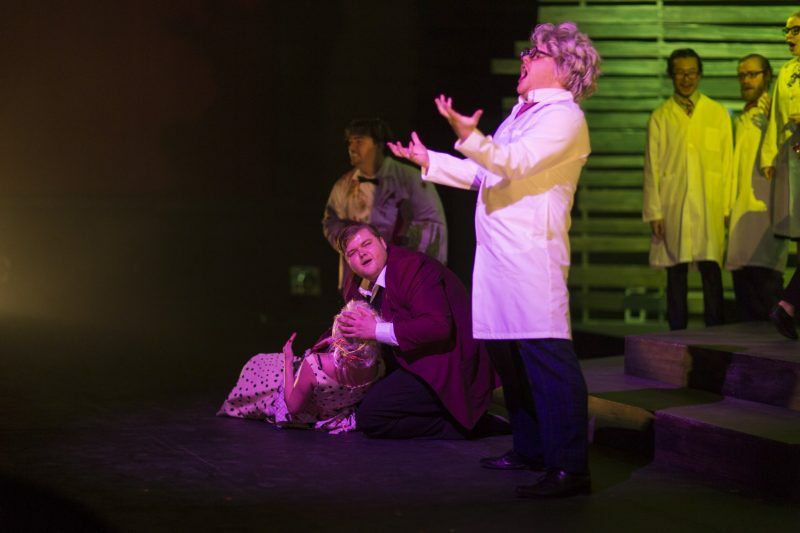 As Robin Melick, a fourth-year performance student who played the character Pitichinaccio in the opera explained, the opera follows Offenbach’s tradition of having a distinct writing style with humor in it. The story begins in a pub, where the titular character Hoffman tells his friends about his past loves, while he waits for Stella, who is performing at the opera. Hoffman continuously tries to court these particular women and none of the relationships seem to prevail. “[Hoffman] is a bit of a doofus who falls for all these women,” said Kimberly Barber, coordinator of the opera program. To play Hoffman is an extremely demanding role, Barber explained. On Friday, Andrew Derynck performed the role of Hoffman. Derynck’s performance was able to strike a balance between humorous and tragic. Hoffman is featured throughout almost every scene and Derynck didn’t falter throughout his performance of the three-hour show. Within the play there are three villains, all who foil Hoffman’s romantic relationships. Chad Quigley played all three of the villains: Lindorf, Coppélius and Dr. Miracle. Quigley was able to play all three characters with ease. The tale is sure to excite those who are not familiar with the world of opera. Each character had their own distinct mannerism that distinguished them from the other characters, so it never felt like the same person was playing the different characters. “This opera was written in the 1800’s, but we have bumped it up to the 1950’s,” said Madeleine Levesque, a fourth-year student and co-publicity representative. Barber explained that this is a common practice with many operas and changing the time period helps evoke a reaction from the audience. Within the opera, there were many recognizable tropes, especially within the female characters that Hoffman met upon his journey. Olympia was the typical Stepford wife and Giulietta was the alluring femme fatale that can be found in 1950’s film noir. The costumes were also very reflective of the characters and helped display certain aspects of a character’s personality. Coppélius’s tattered lab coat showed his destructive personality and Olympia’s white dress displayed her youthfulness with her stiff hair-do showing how artificial she was. The Tales of Hoffman was an exciting story filled with interesting characters and beautiful music. The tale is sure to excite those who are not familiar with the world of opera. 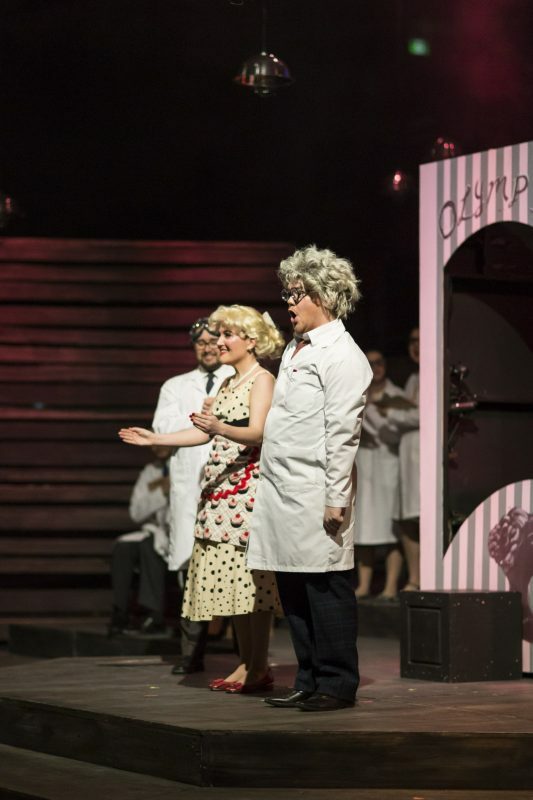 Opera Laurier’s update of the production to the 1950’s added a unique twist to the performance, allowing it to become more identifiable to the audience.